© 2013 by Yoon Ha Lee. Originally published in Once Upon a Time: New Fairy Tales, edited by Paula Guran. Reprinted by permission of the author. The embalmers had anointed Weave-the-Storm in fragrant oils and hidden her face, as was proper, with a mask carved from white jade. In one hand they had placed a small banner sewn with the empire’s sword-and-anchor emblem in dark blue; in the other, a sharp, unsheathed knife whose enameled hilt winked white and gold and blue. She had been dressed in heavy silk robes that had only been worn once before, at the last harvest moon festival. The empire’s people believed in supplying their ruler well for the life in the sea-to-come, so that she would intercede with the dragon spirits for them. The empress had left behind a single daughter. She was only thirteen years old, so the old empress’s advisors had named her Early-Tern-Journeying. Tern had a gravity beyond her years. Even at the funeral, dressed in the white-and-gray robes of mourning, she was nearly impassive. If her eyes glistened when the priests chanted their blessings for the road-into-sunset, that was only to be expected. Before nightfall, the old empress’s bier was placed upon a funeral boat painted red to guide her sunward. One priest cut the boat loose while the empress’s guard set it ablaze with fire arrows. Tern knew perfectly well, as did he, that no matter how steely her composure, the Great Families would see her as an easy mark. But she merely nodded and retired to the meditation chamber. She did not sleep that night, although no one would have blamed her if she had. Instead, she thought long and hard about the problem before her. At times, as she inhaled the sweet incense, she wanted desperately to call her mother back from the funeral ship and ask her advice. But the advice her mother had already passed down to her during the years of her life would have to suffice. The chancellor grumbled and muttered, but accompanied Tern to the first treasury. The treasury’s walls were hung with silk scrolls painted with exquisite landscapes and piled high with illuminated books. The shapes of cranes and playful cats were stamped onto the books’ covers in gold leaf. Tiny ivory figurines no larger than a thumbnail were arrayed like vigilant armies, if not for the curious fact that each one had the head of an extinct bird. Swords rested on polished stands, cabochons of opal and aquamarine gleaming from their gold-washed scabbards, their pale tassels decorated with knots sacred to the compass winds. There were crowns of braided wire cradling fossils inscribed with fractured prophecies, some still tangled with the hair of long-dead sovereigns, and twisted ropes of pearls perfectly graduated in size and color, from shimmering white to violet-gray to lustrous black. But the young empress had swept past him and was heading toward the second treasury. She drew out her heaviest key and opened the doors, which swung with deceptive ease on their hinges. The guards at the door eyed her nervously. The smell of salt water and kelp was suddenly strong. A dragon’s single, heavy-lidded eye opened in the darkness beyond the doors. “Who desires to drown?” asked the dragon spirit in a low, resonant voice. It sounded hopeful. Most people knew better than to disturb the guardian spirit. “Treasures hidden forever do no good,” Tern said. She entered the treasury, leaving the chancellor behind. The door swung quietly shut behind her. Despite the dragon’s protection, it was difficult to breathe through the dream of ocean, and difficult to move. Even the color of the light was like that of rain and lightning and foam mixed together. The smell of salt grew stronger, interspersed curiously with the fragrance of chrysanthemums. But then, it was better than drowning. “What brings you here?” asked the dragon, swimming alongside her. Its coils revealed themselves in pearlescent flashes. Tern craned her head to look at the indistinct shapes of skeleton and coral. “Gunpowder?” she asked. “Don’t trouble yourself about it. It’s not important. Shall I show you the armor?” The undulating light revealed finely wrought armor paired with demon-faced masks or impressively spiked chamfrons. She could almost see her face, distorted, in the polished breastplates. As though they stood to either side of a brook, a flotilla of paper boats bobbed toward them. Tern knelt to examine the boats and half a verse was written on one’s sail. Tern considered it. “It’s an impressive gift, but not quite right.” She envisioned her subjects warring with each other. “These, then,” the dragon said, knotting and unknotting itself. A cold current rushed through the room, and the boats scattered, vanishing into dark corners. When the chill abated, twenty-seven fine coats were arrayed before them. Some were sewn with baroque pearls and star sapphires, others embroidered with gold and silver thread. Some had ruffs lined with lace finer than foam, others sleeves decorated with fantastic flowers of wire and stiff dyed silk. One was white and pale blue and silver, like the moon on a snowy night; another was deep orange and decorated with amber in which trapped insects spelled out liturgies in brittle characters; yet another was black fading into smoke-gray at the hems, with several translucent capes fluttering down from the collar like moth wings, each hung with tiny, clapperless glass bells. “Not especially,” Tern said. In her daydreams she had roved the imperial gardens, pretending she could understand the language of carp and cat, or could sleep among the mothering branches of the willow; that she could run away. But dutiful child that she was, she had never done so in truth. Tern walked among the coats, careful not to touch them even with the hem of her gown. The dragon rippled as it watched her, but forbore comment. “Yes,” she said at last. “This will do.” The coats were wondrous, but they offered their wearers an honest choice, or so she hoped. “What of something for yourself?” the dragon asked. “Ah, so you’ve figured it out.” The dragon’s smile showed no teeth. It extended a hand with eight clawed fingers. Dangling from the smallest claw, which was still longer than Tern’s hand, was a disc rather like a coin, except it was made of dull green stone with specks in it like blood clots, and the hole drilled through the center was circular rather than a square. The most interesting thing was the snake carved into the surface, with every scale polished and distinct. “That is the Coin of Heart’s Desire,” the dragon said with no particular inflection. “Nothing with such a name can possibly bring good fortune,” she said. The dragon did not deny that it was, indeed, a test. Tern looked over her shoulder at the door. Its outline was visible only as an intersection of shadow and murky light. “There’s no other way out of this treasury.” When the dragon remained silent, she touched the coin with her fingertip. It was warm, as if it had lain in the eye of a hidden sun. She half-expected to feel the rasp of scales as the snake moved again. Tern tried to imagine her mother as a young woman, newly-crowned empress, hazy with sleeplessness and desperate to escape this test. “How long have I been here?” she asked. “Not long as humans reckon time,” the dragon said. Its cheerfulness was not reassuring. Tern glanced around again. She might be here for a very long time if this went wrong. “I know what I want,” she said. “I will take that chance,” Tern said. Was this reckless? Perhaps. But as she saw it, the empresses of her line were as much prisoners as the dragon was. Best to let the dragon pursue its own destiny. So this was the real price. “I will stay,” Tern whispered. Not sure whether she was more bemused or bewildered, Tern did so. She felt a curious pang as the coin left her hand. With that, the dragon slipped out of its skin, so subtly that at first Tern did not realize what was happening. Scales sparkled deep blue and kelp-green, piling up in irregular coils around the dragon’s legs. The dragon itself took on the shape of a woman perhaps ten years older than Tern. Her black hair drifted around her face; her eyes were brown. Indeed, she could have been one of Tern’s people. “At least wear something,” Tern said, appalled at the thought of the dragon surprising the chancellor while not wearing any human clothes. “Your empire won’t thank you for giving it to a dragon to rule,” the dragon said, although it did, at least, choose for itself a plain robe of wool. “You will rule with a dragon’s sense of justice,” Tern said, “which is more than I can expect from the women and men out there who are hungering after a child’s throne.” She handed over the keys of her office. The door closed, and Tern was left with the coin and the dragon skin. It was not until many generations later, when one of the dragon’s descendants braved the second treasury, that Tern learned that she had been given a dragon-name. Not a reign-name, for she was done with that, and not a funeral-name, for she was far from dead. The empire she had ceded was now calling her Devourer-of-Bargains. After all this time, she had come around to the dragon’s own opinion on this matter. It was a confusing human practice, but she wasn’t in any position to argue. A number of generations after that, when a different empress braved the treasury, Tern asked what had become of the Dragon Empress from so many years ago. The empress was looking wistfully at a particularly lovely beryl set in silver filigree. Eventually she returned her attention to Tern, but she kept glancing back at it. The woman’s face looked oddly familiar, but Tern couldn’t place it. Probably a trick of her imagination. The rest of the conversation was fairly predictable, but Tern contemplated the dragon’s sense of justice once the empress had gone. Time moved differently underwater, after all. She could wait. 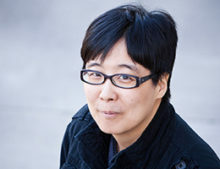 Yoon Ha Lee’s debut novel, Ninefox Gambit, won the Locus Award for best first novel and was a finalist for the Hugo, Nebula, and Clarke awards. Its sequel, Raven Stretegem, was a finalist for the Hugo. His middle grade space opera Dragon Pearl is forthcoming from Disney-Hyperion in January 2019. His short fiction has appeared in Tor.com, The Magazine of Fantasy and Science Fiction, Clarkesworld Magazine, Beneath Ceaseless Skies, and other venues. Lee lives in Louisiana with his family and a very lazy cat, and has not yet been eaten by gators.